Splendid pair of table lamps, wrought iron and original parchment lampshades. Spain, Barcelona, circa 1950. 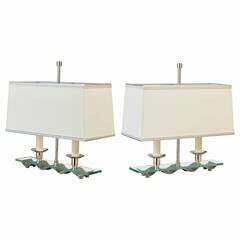 Ravishing pair of orientable table lamps, iron and ivory lacquered aluminum, original bayonet lamp holder. France, circa 1950. Pair of mini table lamps, polished brass and lacquered steel. Black and golden lampshades. France, circa 1950. Table lamp, wood covered with leather, light thread sewing, jute lampshade with a brown fabric edging. Spain, circa 1950. 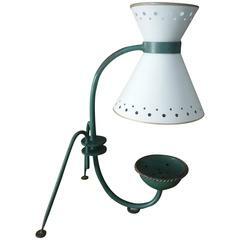 Tripod base standing lamp, polished solid brass base, steel stand cover with saddle stitching leather from origin, jute lampshade. Spain, Barcelona, circa 1950. A pair of German black iron table lamps on a sculptural triform base. The measurements stated are of the lamps without a shade. 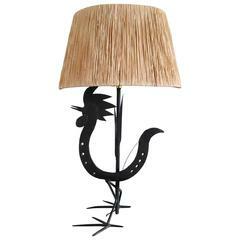 We have a matching floor lamp available. Raffia needs to be fixed. European socket and wiring. This item will ship out of Paris France. Price does not include shipping and possible customs related charges. 1950s criss-cross iron table lamp. This unique and architectural design suspends the cylindrical burlap shade. - made in Czechoslovakia - made of antik glass, metal - new cabling - fully functional - original condition. Pair of table lamp, circa 1950s. Metal cube articulated in a iron frame Acrylic screen Teak bases One with brass screws the other with chromed screws, original. 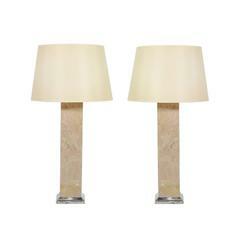 Fully restored pair of travertine table lamps in the style of T.H. Robsjohn-Gibbings. Travertine in excellent vintage condition, chrome stands newly polished. Both fully rewired.